Home Natural Remedies	Eliminate Nicotine and Opioid addiction with Nigella Sativa! If there’s one thing I loathe it’s inhaling the cancerous smoke polluting our air from those cigarettes of death. The bought and paid for government agencies that are supposed to protect us allow the tobacco industry to poison us with these cancer-causing addictive death sticks that contain approximately 600 harmful chemicals. Some of these chemicals are carcinogens, toxic metals and poisons like Nicotine which provide the addictive element in cigarettes. So when you really think about it the smoker is really getting screwed, they’re stuck with never-ending addiction, plagued with cancer, while also spending a fortune on cigarettes to finance their own demise. Even if a smoker finds the strength to quit, it’s literally impossible because of the addiction to nicotine. It’s obvious the tobacco industry designed cigarettes so that you’d never escape them, except by death. But what’s ironic is what today is considered an escape from smoking, is actually a loop right back into the hands of the tobacco industry. Comically to them smoking a vape or spending hundreds of dollars on nicotine patches is considered quitting smoking. The Patches can become quite expensive as a 12-week supply of nicotine patches would cost $180, and a 12-week supply of nicotine gum would cost about $240. That’s $420 for less than three months of nicotine replacement treatment. But what if I told you two simple pills or a teaspoon a day of nigella sativa will eliminate the cravings for nicotine. Yes, it’s true there’s actually research articles in the United States Library of Medical Research on how Nigella Sativa (black seeds) will wean you off of opioids and other harmful addictive poisons. How does Nigella Sativa do this? There are myriads of anecdotal claims in online forums of opioid addicts weaning themselves off of opioids using Black seed oil(nigella sativa), and more amazing with absolutely no withdrawal symptoms or relapses. Click here to read a research article from the US Library of Medical Research on the successful use of Nigella Sativa on the treatment of opioid dependence. It gets better, I have two friends who both have been smokers for over 15 years. One friend had already started the battle against nicotine for a month before for other health-related reasons she started to take a teaspoon of black seed oil twice a day. Miraculously she informed me that since she started the daily regimen of black seed oil she had absolutely no cravings to smoke whatsoever. My other friend instead of using the black seed oil used the ground black seeds instead to rid herself of a virus. Coincidentally she decided to stop smoking after she started taking the grounded black seeds, but this was not the first time she had tried to stop smoking, as the addiction to nicotine would always eventually get the best of her. But this would turn out to be her last battle. She emphatically called me with great joy and told me she had absolutely no nicotine cravings since she had been ingesting the grounded black seeds. It appears that whether using the extracted oil or the grounded seeds of Nigella Sativa it will wean one off of opioids or other harmful chemicals like nicotine. I actually sell organic grounded Black seeds on Etsy.com, click here if you would like to purchase them or you can buy them directly from this site here. 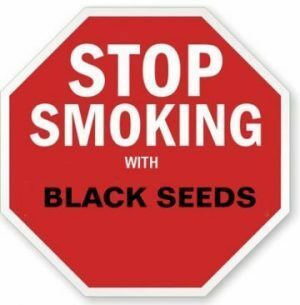 Did your friends quit smoking already or did they stop smoking after taking the black seed? Theu had already started by about a few weeks each. I started taking black seed oil (nigella sativa) for allergies, replacement for anti-depressants and to have more energy. I have been a smoker for 50 years and have tried to quit numerous times. I decided to try to quit again while I was taking black seed oil, thinking I was feeling so relaxed and energetic since taking it, how much better would I feel if I didn’t smoke. To my shock and horror, hardly any cravings, and unlike other times I didn’t eat all day also minus the other side effects of quitting. I gave up easily and haven’t smoked for 7 months. I now and again feel like one, but I have the choice now not to light up. Sadly I had to stop taking the black seed oil as it began to irritate my stomach and I was feeling very sick, apparently this does happen with some people. I tell people and most look at me as if to say, oh yeah, why haven’t the mainstream heard about this. I truly class it as a miracle for many things, and I wish doctors knew about it as well. I truly regret I can’t take it anymore, but it served a good purpose while I was taking it. What brand of black seed oil were you taking? And how were you taking it? I’ve never heard of this reaction before, you might consider taking the powdered seeds instead.